A Peoples’ Democratic Party (PDP) presidential aspirant, Senator Ahmed Makafi, has said the party must work on the psychology of voters in the northern part of the country to defeat the ruling All Progressives Congress, APC, and President Muhammadu Buhari, its likely candidate in the 2019 general elections. He also argued that PDP must field a very strong candidate to stand any chance of defeating Buhari. 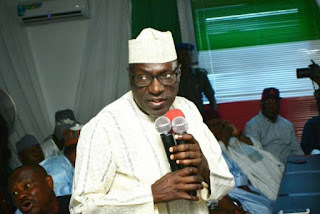 Makarfi argued that he qualified for the Office of the President having served as Governor of Kaduna State for eight years, Senator for another eight years where he chaired the Committee on Finance and PDP National Caretaker Chairman. The former Kaduna governor promised to tackle insurgency, herdsmen killings, insecurity, unemployment, epileptic power supply, infrastructural challenges and other problems confronting the polity. Makarfi said the sectarian problems and security challenges facing the country and confronted Kaduna State during his tenure but he was able to overcome them with tact, consensus buildeand deployment of resources. He said the PDP must win very well in the North to make any headway in the presidential election adding that the party must present the candidate the people of the region repose trust in. Makarfi said: “If we want to the election, we must not lose the North and we should give them the candidate they trust in the North. “The problem for us winning is the North; the current President comes from there and there is blind followership there. If we want to win, we should field a strong candidate from there. Speaking further on his manifesto, Markafi said: “First of all is the restructure of the country to make it good for everybody, restructuring of the security and creation of jobs and infrastructure development in all respects and promoting the private sector so that it can become effective employer of labour. “We have also look at some issues protocol that we have which have negative impact in the country. Any issue of protocol that doesn’t serve national interest in terms of security we will dialogue with other country where they have got it right and restructure ours. “I have been tested and proven myself as governor of Kaduna State as selected Chairman of Senate Committee Finance, my records are there and as party chairman of PDP when people are not given the chance to make the party to survive. “I was able to bring everybody together and ensure that the party survived and that is why many more people are defecting to PDP and they are all welcome. “When I was in the Senate, we ensured transparency on the part of the Federal Government on the allocation of federation accounts which now made all state governors to ask for accounts of the federation from which they have their share. “We brought back PDP and made it now a threat to APC. I restructured Kaduna, and Nigeria needs restructuring. I am not talking politics. “I was the architect of the first political sovereign conference in the country as head of the committee under former President Olusegun Obasanjo. “Institutional restructuring that would include the police, INEC and other security apparatus to ensure they do not serve the dictates of the paymasters will be done by me. “We must make our institutions to be accountable. We will ensure comprehensive restructuring of this country. I chose to travel by road for all my campaigns traveling by road is taking eighty percent of my tour. “This is to enable me see the deficiencies of our infrastructure, such as roads, condition of our people and our environment among others.